You can read about it, talk about it, ask an expert about it, watch videos about it, Google it...but in the end, there is no substitute for just DOING it. In other words, skiing is basically the same as playing the violin. I discovered this last week, when my husband, two kids and I defied the apocalyptic National Weather Reports, packed way too much stuff into our Prius and headed for Mammoth Mountain in the central Sierras of California. All the practice I'd logged as a kid, skiing maybe a dozen times, seemed to help me. Not that I could start where I was then, but I did have some feeling for skiing. Robert and the kids were starting from scratch, and that's a different matter. Skiing involves learning a whole new set of sensations. One simply has to do it repeatedly in order for this kind of activity to take on the feel of something familiar. Adults are used to negotiating the world and its little tasks with ease, and so committing to something new like this is a major deal. Robert had a great attitude: he was patient, he took the falls like a good sport (though his knee is still in recovery!) and he slowly worked on the techniques of turning, etc. On the second day we took him up the lift and down the slope – a blue slope because of all the powder! It was steep, and not easy. What was remarkable was that at the top of the slope, he was a beginner, with a good deal of trepidation and awkwardness. By the bottom, he was beginning to put it all together, and even surprised himself with a few very natural-feeling turns. Those moments of putting it all together have stayed in his mind; he is determined to get back to it and build on what he learned. My children also learned a few new sensations. Living in Southern California, they scarcely have seen snow. They had doubts about the need for all this gear: snow pants, long underwear, fleece, gloves, glove liners, socks, sock liners, a face mask, goggles, a helmet. It's approximately same amount of equipment required to walk on the moon. "You need the right gear," I said firmly, remembering my dad taking me to Colorado's north-facing, windy-cold Loveland Basin in knit gloves. "If you are set up right, it is so, so much easier. If you are cold, it's all you're going to think about." After some convincing, my daughter traded her fleece gloves for the ski gloves, and the kids headed to their lessons in those impossibly clunky ski boots. In the beginning, they approached their little runs down the tiny beginner hill with the kind of enthusiasm they reserve for eating the rest of their broccoli. As it is hard for some beginning violin students to draw any connection between drilling Twinkle rhythms and playing music on the violin, I realized that my kids weren't seeing the connection between this rather lame patch of snow and the glorious mountain behind them. As they saw it on their first day, skiing was pretty dull: waiting to go up a tiny hill, making your way around some plastic octopuses, getting in line again. Yawn. 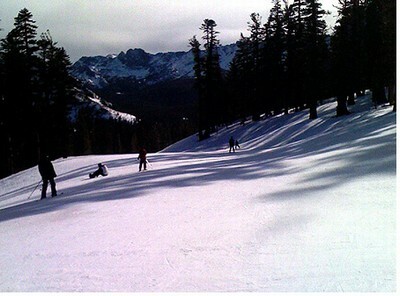 But the next day they skied. Each of them rode the big chairlift and skied down a "real" run. Both of them caught on fast, and I think now they understand what it's about. For me, the challenge came on the big blizzard day, when I decided to go ahead and take the ski lesson that I'd already paid for (no refunds, unless the mountain closes). Though a few friends from our party came along, the rest of my family stayed back at the cabin as I headed into the snowing, blowing, mounting blizzard. A view, a lot like the one from my goggles. I started on the "long" bunny slope, which the day before had been almost icy: a place to practice making turns. Today it was covered with powder, and the ski instructor said to just point the skis straight down the hill and go as fast as possible. It was a totally different approach than yesterday. 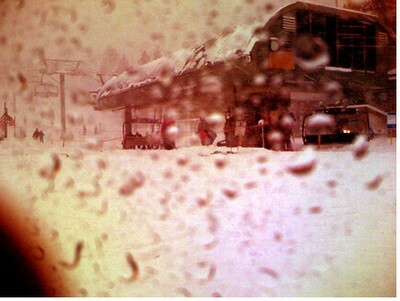 "You won't ski very often in conditions like today," said one instructor who was working the tow lift. "Use the sensations you get today to make yourself a better skier." As luck would have it, I had an awesome instructor: Bobby, who also teaches blind skiers how to ski. Only two other people were in the class, and one bowed out after only one of the three runs. I completely trusted my teacher, even as we reached the blustery top of the ski lift. I simply skied in his wake through all that powder and blowing snow. Halfway down one run ("Bridges"), I glanced around at the tall pines, drooping from heavy snow; edged my skies through a powdery turn, felt the majesty of the mountains around me and said to the howling wind, "I LOVE SKIING!" Congratulations, Laurie. You're a real risk taker -- er, I mean trooper. It sounds like you had a lot of fun. Thanks for the gorgeous photos. 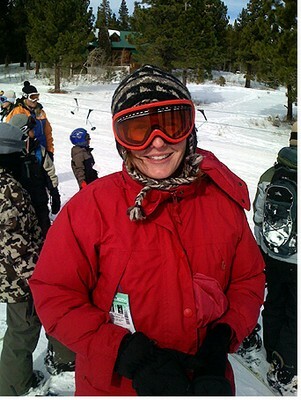 Aww Laurie.....all that beautiful snow! 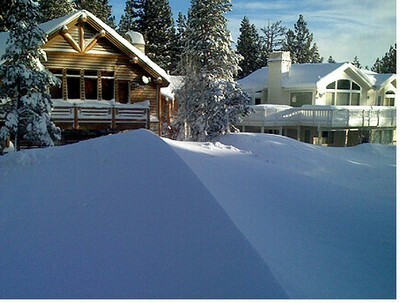 *sob* I miss home with snow! It should snow in Vancouver more often. Wonderful article Laurie - I'm so glad you all decided to go. There's nothing quite like it and it's great for the family too. I bet you are already planning your next trip! My wife and I miss living in Colorado and skiing daily, it's so relaxing and fun. Glad you had the chance to go. Thanks, everybody! And Ray, once you've lived in Colorado, it's in your blood. It's where I grew up, and even though California is beautiful, I miss Colorado too! Laurie - have fun but be careful out there. The usual encouraging comment to a performer - "break a leg" - is not one you want to use in the skiing context. It sounds like you had a great time and a real adventure! Can we give you a "Brava!" for braving the weather? I'm glad you decided to take a refresher class. For any newbies reading this, it's amazing what just one lesson can do for you.